In mid-19th century New York teemed with waifs known as “street arabs” – the orphaned or abandoned children of prostitutes, drug addicts and alcoholics -- who fended for themselves. The dirty, neglected children slept in stairways and parks. Some earned pennies selling newspapers or shining shoes; others turned to pocket picking or other crimes to survive. The Children’s Aid Society depended heavily on the donations of the wealthy in order to fund lodging houses, industrial schools, and reading rooms. 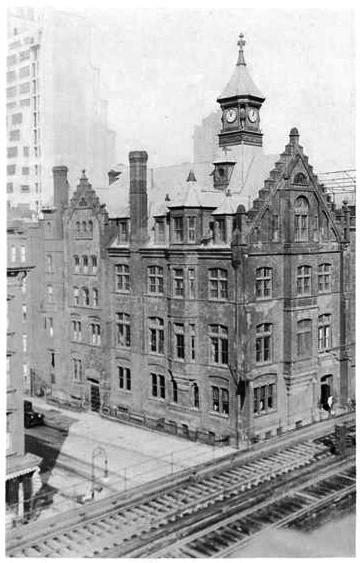 In 1887 John Jacob Astor funded the 14th Ward Industrial School on Mott Street, while almost simultaneously banker and entrepreneur Morris K. Jesup provided the money for the lodging house and school at No. 247 44th Street, at the corner of Second Avenue. Indeed the building, completed in 1888, was, like its fraternal twin on Mott Street, a Victorian Gothic pile of brick, terra cotta and brownstone, liberally splashed with Flemish Revival elements like the prominent stepped gables. The delightfully irregular roof with its many dormers, chimneys, and projections, was crowned with a four-sided clock tower. Industrial schools city-wide offered training to orphaned or neglected boys; providing them with a trade when they entered society. But the Crippled Boys’ Brush-Shop was unique. Regarding Peter, The Evening World said “Success of heredity, or both influences, turned his head. He took to drink, became ungovernable and was suspended. He retaliated by getting out in the street with a pocketful of stones and riddling the windows. The other crippled boys continued on. They began work at 7:00 in the morning and worked until 5:00. They received one hour break as well as a free lunch. The boys were compelled to attend one hour of night school following work from October through March. If they went out at night, they were required to return by 10:30 during the weekdays and midnight on Saturday. The brush makers paid five cents to live in the house and five cents for evening meals. If they broke curfew, they were charged extra for their beds—between 7 and 11 cents. Those trying to get back into the lodging house after midnight would find the doors locked. Between 1888 and 1889 the Lodging House furnished beds to 33,474 boys who came and went. It supplied 53,107 meals, of which 45,524 boys were able to pay their nickel and 7,583 were supplied free. During that 12-month period, 378 boys found homes and employment. The Children’s’ Aid Society was a favorite cause of many of New York’s wealthiest citizens. Thanksgiving and Christmas were, of course, times when benevolence shined brightest. 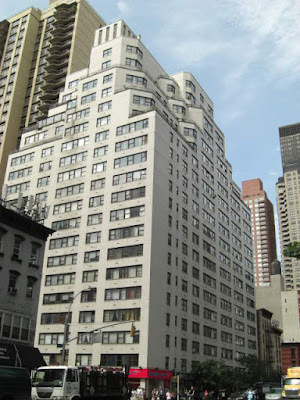 The boys at the 44th Street Lodging House who routinely ate meagerly were treated to a bountiful Thanksgiving dinner, for instance, in 1894 when millionaire William Earle Dodge’s family not only paid for the feast, but joined the boys for dinner here. When the conductor, 22-year old Thomas Chivers, realized Widmore had sneaked onto the trolley, he fought with the boy. The motorman, 47-year old Henry Smith, joined in and they physically threw Widmore off the moving trolley. The boy landed on a stump, causing internal injuries. He died in Flower Hospital of peritonitis. Tragedy touched the lives of other residents. On August 11, 1907 19-year old John Kelly sought to escape the city heat by swimming in the Harlem River. He did not know how to swim, and wore a pair of rubber water wings which were slightly too large for him. He was swimming a few feet away from a moored barge loaded with bricks when someone dived from the vessel. Startled by the splash, Kelly jerked and his water wings dislodged and floated away. Finally the panicked, flailing boy sank for the last time. The taint of homelessness and poverty was more powerful than the glow of heroism in the case of James Coleman. Frustrated in its failed attempts to nab the notorious burglar Eddie Fay, the City of New York offered a staggering $17,000 reward for his capture in 1910. James stuck out his foot and tripped the felon. He then jumped on the crook and held him until police could apprehend him. A witness, Frederick Keppel, offered to write a letter testifying that it was the newsboy who detained Fay. On April 1 the boy walked into the Mayor’s office with Keppel’s letter. Mayor Hugh J. Grant listened to Coleman’s story and read the detailed account provided by the well-respected Keppel, a picture frame dealer with the fashionable address of No. 4 East 39th Street. The Times said the boys had followed Roosevelt’s movements through “dispatches in the local Italian newspapers.” Now, with the arrival of the picture postcards and a sheet of Cairo Hotel stationery with the message “With all good wishes for my friends, both teachers and pupils,” the children were elated. It would be a short-lived endeavor here, however. 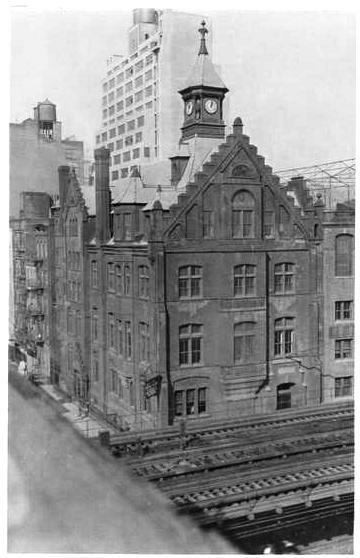 Four years later the Society sold the building as a modern Kips Bay Boys’ Clubhouse was planned. The venerable Vaux & Redford structure was demolished, replaced with a playground which in turn made way for the 1964 Olympia House apartment building. Very good post today! Too bad someone didn't write a book about the inhabitants of the place! Glad you enjoyed it. You're right--a book on the boys who came and went through any of these lodging houses would be riveting.